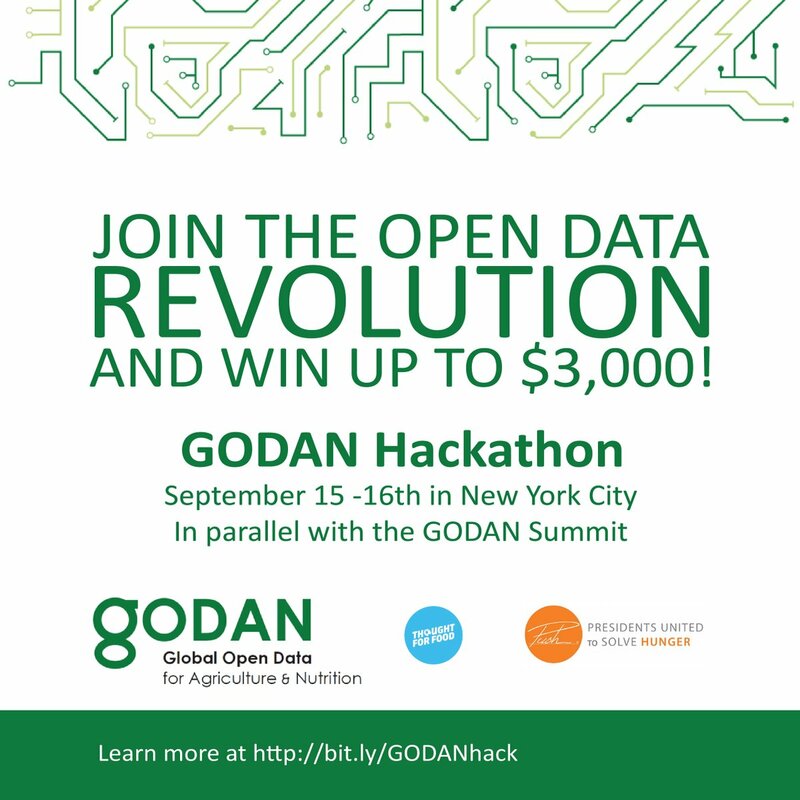 During the GODAN Summit 2016 happening September 15-16, 2016, GODAN is hosting the Open Data Maker’s Hackathon, bringing together software and agricultural innovators to create the beginnings of practical solutions that allow for better utilizing, collecting, and/or making more accessible open data to improve our food system. In an effort to support young, next generation innovators, this hackathon is intended for current university students and/or entrepreneurs 26 years old and younger. Added bonus: attending the Open Data Maker’s Hackathon grants you free access to the GODAN Summit 2016, bringing together high level government, industry, and NPO organizations around open data in agriculture and nutrition. This is a $75 value with tremendous networking opportunity. Time: 24 Hour Hackathon starting at 10:30am on September 15, ending the next day at 10:30am, with Award Ceremony scheduled for later in the day. Cost: Free, with limited spots available. First come, first serve! *Please note that as the hackathon is a local event, transport/ accommodation for this event will not be provided. While hacking can definitely be a bad thing in this world, the term can also have a good connotation. Hacking also refers to the work of writing computer code. When we refer to a hackathon, we mean a large community of people coming together in an endurance challenge of writing code for a beneficial purpose. GODAN supports the proactive sharing of open data to make information about agriculture and nutrition available, accessible and usable to deal with the urgent challenge of ensuring world food security. It is a rapidly growing group, currently with over 307 partners from national governments, non-governmental, international and private sector organisations that have committed to a joint Statement of Purpose. I don’t know anything about computers, I just care about nutrition, food, and/or agriculture. Should I join? Yes, we need you just like we need coders. The development of real solutions will not happen in a vacuum, it will not happen in a Silicon Valley Boardroom, and it will not happen without the direct input of knowledgeable practitioners. We need diverse insight for open data to truly be unleashed. You will not be expected to write code. We need you to be able explain the how, what, why, when and what-ifs of agricultural production, nutrition, and/or food security as you know it. This is your chance to have software developed, on the spot, for your very own needs! What happens to my project after the event? This is a pro bono endeavor. This means our purpose is to simply create the space open data for nutrition/agriculture and software developers can collaborate. We do not take ownership of any concepts or intellectual property (IP). We also state very clearly that our hosts and sponsors do not have any claim to the IP developed during our event. The IP belongs to the team’s participants. Our hope is that the event sparks some collaborations which lead to start-ups or custom development, outside of us. Select projects will be outlined on our website after the event. What open data will be available for use at the hackathon? Check out this OPEN DATA! Can I participate even if I’m not a coder or if I am new to coding? Of course! We are looking for designers, marketers, entrepreneurs, open data enthusiasts, forward-thinkers, curious minds, and more to be part of our hackathon teams. We will pair you with coders and developers to complement your skills. Unfortunately, you must be 18 or older to participate in our event, and 26 years old or younger. Are you looking for volunteers or partners? Yes! If you are interested in being a mentor for our teams, volunteer to help out during the event, please reach out togodan@tffchallenge.com. Each team will be made up of 4 attendees. If you have a group of 4 ready, you can register together as team (by listing the same team name). You can also register as an individual, a team of 2, or a team of 3. We will match you with other attendees based on your set of skills (see the registration page) to complete the full group of 4. We will notify you ahead of time about which group you are in so you can introduce yourselves and start brainstorming (if you want!) before the event. If no group is assigned beforehand, you will have the opportunity to create a team onsite. We will be providing snacks, meals, candy, water, and coffee. Meals include breakfast and lunch, and will be provided by GODAN Summit 2016. Is this a continuous 24-hour event? Yes, this hackathon will be held over a continuous 24 hours, from 12pm to 12pm. If you wish, you will be able to rest at the hackathon space, or you are welcome to go home to rest and return later (we highly encourage the latter, just so you are fresh for the next day and ready to present your idea). Participants will not be required to stop coding. You will be required to provide your own laptop, mobile device, and any necessary chargers. As this will be a 24-hour event, you may also bring basic toiletries or a change of clothes. Can I sign up a friend using my information or send a friend to attend in my place? In order to help us organize the event in the best way possible, all attendees must register using their own information. Teams will be organized according to the information you provide during registration; any changes will affect the other hackathon attendees. No policy, but we do ask for you to inform us. This is nearly a sold-out event, and want to make sure everyone who wants to attend is given the opportunity. Please send any questions/comments/concerns to godan@tffchallenge.com.